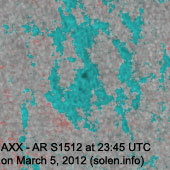 Last major update issued on March 6, 2012 at 05:55 UTC. 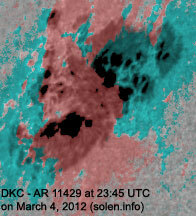 The geomagnetic field was quiet to unsettled on March 5. 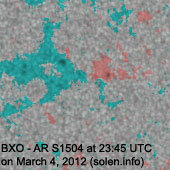 Solar wind speed at SOHO ranged between 319 and 368 km/s. 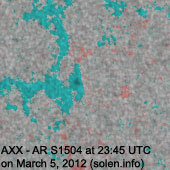 A low speed stream from CH506 began to dominate the solar wind late in the day. 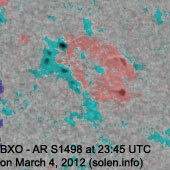 Solar flux measured at 20h UTC on 2.8 GHz was 131.6 (increasing 24.4 over the last solar rotation). The planetary A index was 9 (STAR Ap - based on the mean of three hour interval ap indices: 8.9). 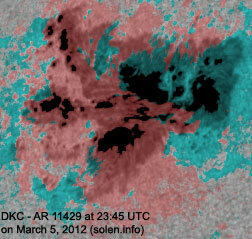 Three hour interval K indices: 22232223 (planetary), 23331222 (Boulder). 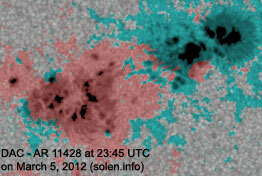 Region 11423 [N16W74] was quiet and stable. 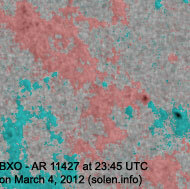 Region 11424 [N08W59] reemerged with a single spot. 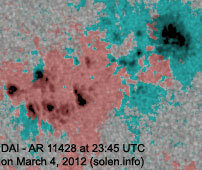 Region 11428 [S17E23] developed further and could produce M class flares. 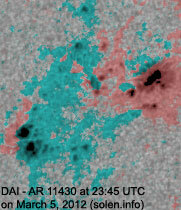 The region has small magnetic delta structures in the trailing penumbra. 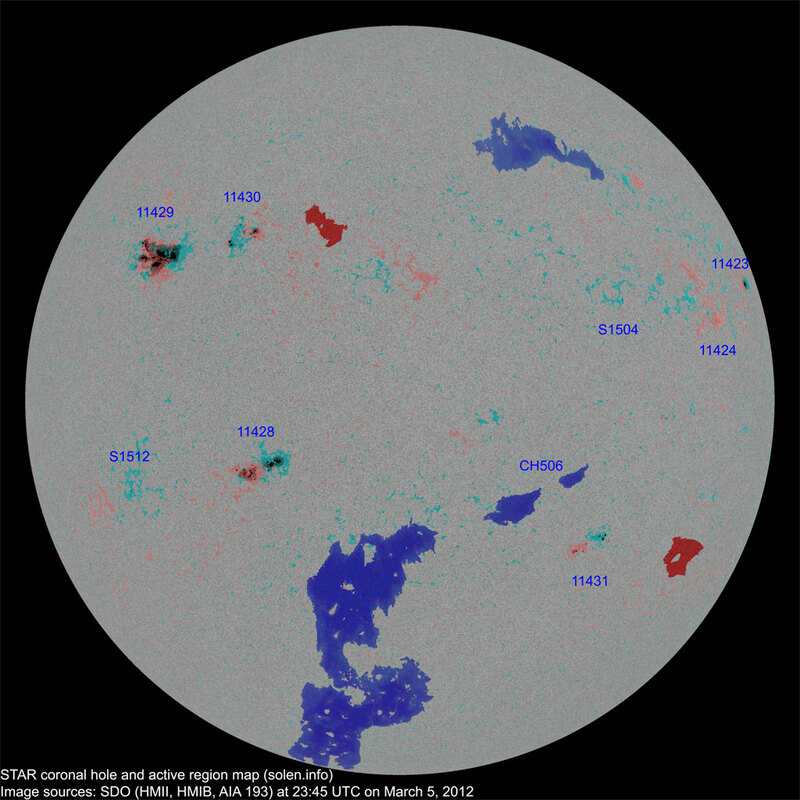 Region 11429 [N17E42] increased in area with nearly all spots inside a single very large penumbra (extending 7 degrees latitudinally and 9 degrees longitudinally). 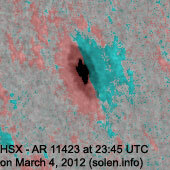 Umbrae near the inversion line are large and the region may be capable of producing an X10+ flare. 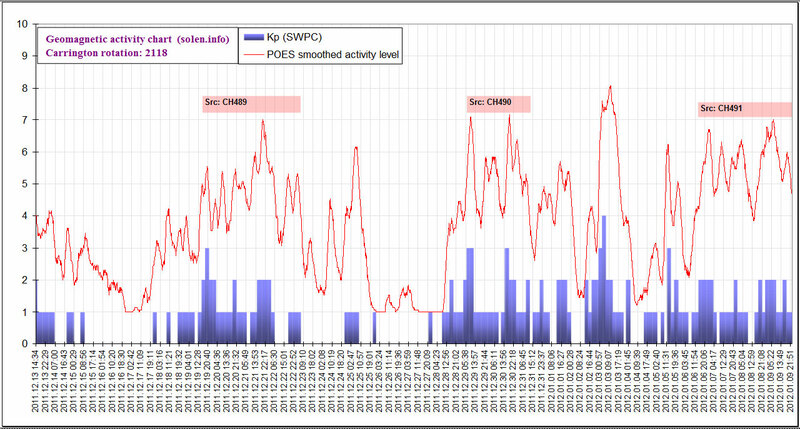 Flares: C3.4 at 00:36, X1.1/2B long duration event peaking at 04:09 (associated with a full halo CME), C2.3 at 10:32, C5.8 at 12:13, C5.4 at 15:04, C7.8 at 15:29, C9.8 at 16:22, C4.6 at 16:50, C6.8 at 18:37, M2.1/1B at 19:16, M1.8/1B at 19:30, C1.7 at 20:15, M1.3 at 22:34, C1.6 at 23:20, C2.4 (beginning at 23:50 and peaking) at 00:04 UTC. 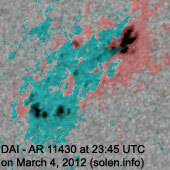 Early on March 6 the region has already produced 3 minor M class flares. 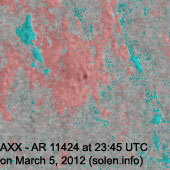 New region 11431 [S28W35] emerged in the southwest quadrant on March 4 and got an SWPC number the next day. 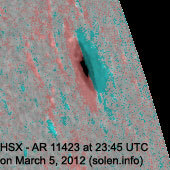 March 3: No obviously Earth directed CMEs were observed in LASCO and STEREO imagery. 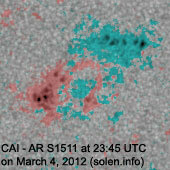 March 5: Another full halo CME was observed after the X1 event. 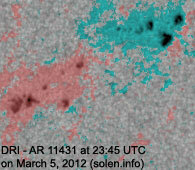 The CME could reach Earth on March 7. 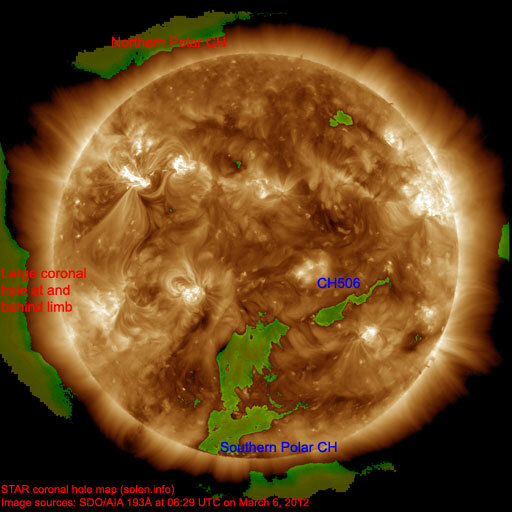 The geomagnetic field is expected to be quiet to active with a chance of minor storm intervals on March 6-7 due to effects from CH506 and the CMEs observed on March 4 and 5. Quiet to unsettled is likely on March 8.